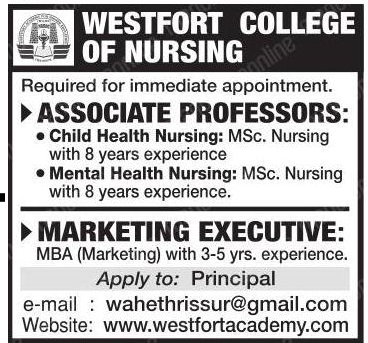 Westfort College of Nursing, Thrissur has advertised in Malayala Manorama newspaper for the recruitment of Associate Professor jobs vacancies. Interested and eligible job aspirants are requested to apply by earliest. Check out further more details below. About College: Westfort Hospital was started in the year 1989 to cater medical, diagnostic and surgical care services to the community at Thrissur and neighbouring districts in Kerala. It is further expanded to one more Allopathy and Ayurveda hospitals founded by Westfort Hospital Group so as to meet the changing health needs of the society. As these hospitals were growing as the leading hospitals in the District, Westfort Hospital Group Management extended its horizon of activities to various other fields like health management, management studies, information technology, hospitality, guest care and tourism etc. with a view to offer wider choice of subjects to studies to the student community of the state and to facilitative quality care under one roof.